Rainbow Sugarcraft: New Cup Cake Wedding Cakes for 2010! New Cup Cake Wedding Cakes for 2010! 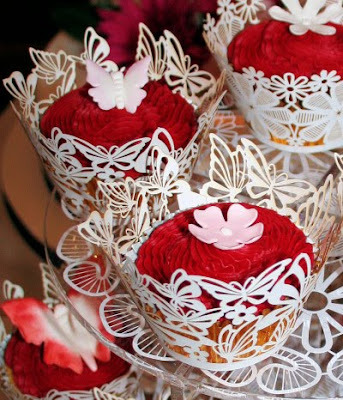 New for this season these gorgeous cup cakes wraps are perfect for dressing up individual cakes to stunning effect. Any colour theme or decoration style is possible and the Wedding Cake display can be designed to suit any number of guests. We deliver our Designer Wedding Cakes and Croquembouche throughout Scotland and Northern England and we also supply a wide range of cup cake stands so you can be sure of a georgeous display. Just email us with your Wedding date, venue address, colour theme and number of guests and we can send you some fabulous ideas and quotes!